This is a double album, whose first album includes recordings from the SWEET’s live gig in the Rainbow Theatre, London, 1973. It has thus pricinpal importance, because it was the first possibility to get acquainted with feeling of SWEET’s live gigs for the funs who have had no possibility to see SWEET in concerts upto then. The second album is a selection of their songs without any concept (but maybe there was only one concept: it includes only songs recorded since the beginning of 1973 are selected). The album includes three songs that have not been released previously on any album, but only one (I Wanna Be Committed) of the three is brand new. The other two (Miss Demeanour and Burn On The Flame) songs has been released as B side of singles. It is a great and very special composition. Steve handles the lead vocal in which he is singing by acrimonious begging, ha is almost crying. Also the refrain sung by the choir has a painful feeling and they are singing it by strange pulsation so it all has a bizarre atmosphere. The middle instrumental section is short and consists of some lingered high guitar voice only. After it the original theme is coming back, but the listener, who believes that it was all, is wrong, because instead of some short closing theme or fading, an elementary closing section is coming immediately after the last refrain. It is a completely separate jazz-rock mini-piece that is based on Andy’s virtuoso guitar improvisation. It is devastating speedy and twisting, Steve’s bass is pulsatingly thundering and Mick’s drumming is particularly refined work that is rather boding the rhythm than beating. It is very excited as the lingered twanging of Andy’s accompanying electric guitar is blurring the speedy twisting. It is one of the most sophisticated instrumental part in SWEET’s music. It was the B side of the single The Six Teens. 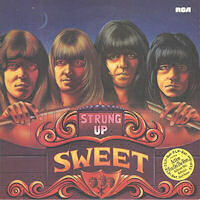 The song does not belong to the strongest songs of SWEET. It is not wrong, but does not contain exceptional value that is worth to mention here. The listener feels a bit as if they had no inspiration to write a song, but they had to put a song on the B side of the single. They wrote it by routine. However, the closing part with its bluesy rhythm and guitar work is interesting. It is a very weak composition, only two things are to be excepted: one is the remarkable bizarre feeling of the verses with the strange guitar sound from Andy that is accompanying the singing during the song. The other is Mick’s fantastic weird tolling in the middle section.